Varieties of tower types are used in practice. 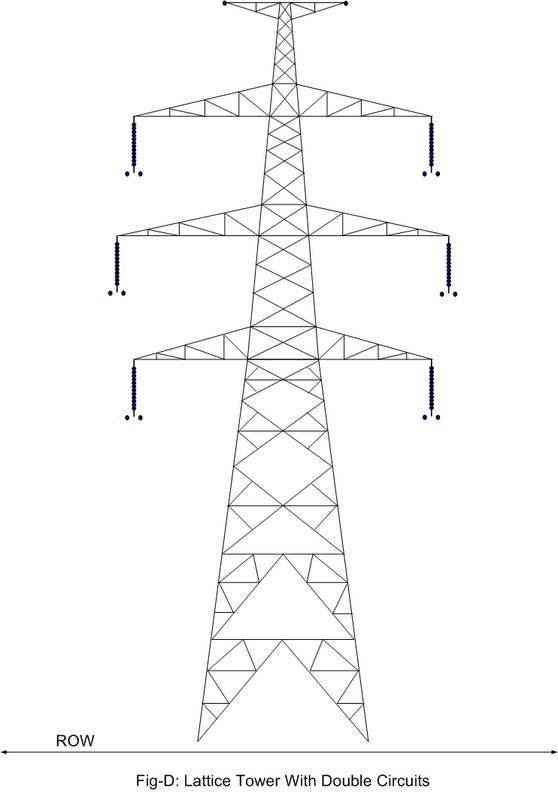 Traditionally self supporting lattice structures are used for electricity transmission line towers (see Fig-A). You will mostly find the use of self supporting type lattice structures for transmission lines in most of the power companies . The lattice structures can be erected easily in very inaccessible locations as the tower members can be easily transported. Lattice structures are light and cost effective. The main disadvantage of lattice structure is that it requires more ROW (Right Of Way). Right Of Way is the stretch of land acquired along the route length of line keeping the towers in the middle of ROW width. 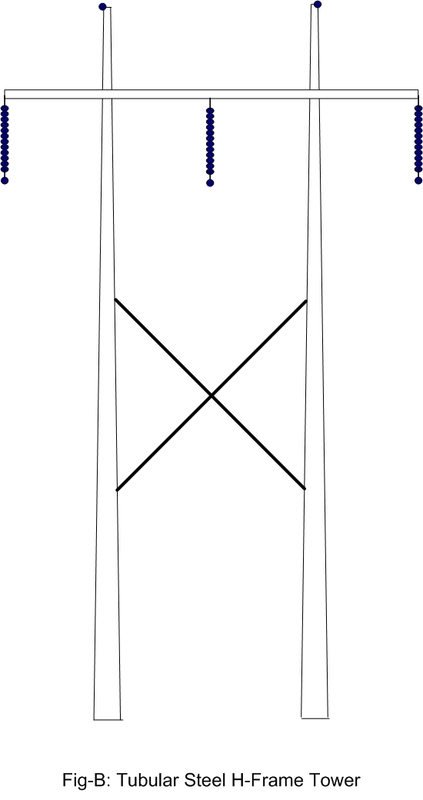 See Fig-D where the width of ROW is shown by double headed arrow. The ROW width is as per the standard set by Local authority or government agency. Clearly ROW is more for higher voltage line. 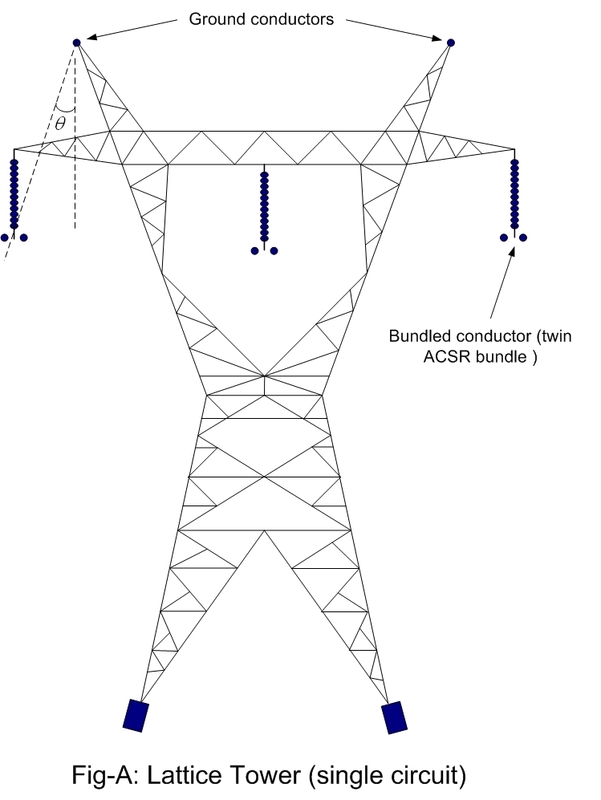 In the sketch of a single circuit lattice tower (Fig-A), two numbers of ground conductors are used. Theta is the shield angle. For reliably protecting the conductors from lightening this angle θ should be less than 30 degrees. In the Fig-A the phase conductors used are bundled type (twin conductor). In many cases due to public resentment the use of lattice structures has been restricted. So alternative transmission structures are adopted by some power companies. Steel tubular pole structures have been used quite successfully by some power companies for high and extra high tension transmission lines. The installation of these structures are costly but requires less time. See the sketch of a tubular steel pole structure (Fig-B). The tubular structure can be a single tubular form or H-form. Like Lattice tower it can also be designed for carrying two or more circuits. 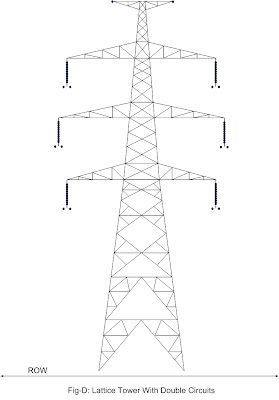 A lattice tower with double circuit is shown in Figure-D. More transmission companies are considering the use of this type of tower especially in populated areas. The lattice guyed-V transmission towers has also been used by the transmission companies in cases where more space is available.. These are simple, easy and cheaper to install. The guyed towers also require less time for installation. The main disadvantage is that these towers require more space due to presence of guy wires. See the sketch of the tower (Fig-C). 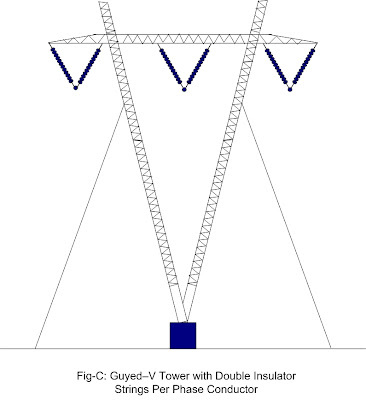 This tower uses two string insulators per phase arranged in V form. Another classification is from the point of view of materials used. The transmission towers are usually made from steel and galvanized steels. Aluminium is also used as construction material for transmission lines. In many countries wooden transmission towers are also used for HV/EHV transmission, if plenty of wood of considerable length(or height) is available at reasonable cost. The wooden towers are mainly single pole or H-frame type. 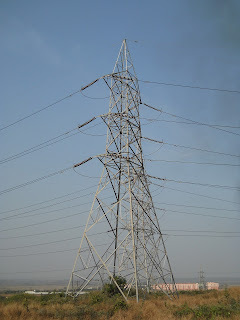 Even concrete poles/towers are used by transmission companies of some countries for HV/EHV power transmission. Another main classification is from the point of view of functioning of tower. That means whether the tower is suspension type, angle type or dead end type. Depending on the deviation angle of the line the respective tower is chosen. The suspension type of towers only carry the load of the conductor in normal situation. However suspension towers are usually designed to work satisfactorily for very small angular deviationn of line. The standard code of practice of different countries has specified the maximum deviation angle for use of suspension towers. The angle towers are used when the line route deviates more than this specified maximum angle. The angle towers can again be sub grouped for different ranges of angular deviation. So the towers can be categorized as small angle, medium angle or large angle towers. The towers used at the termination point of line are dead end towers and are designed to carry large unbalanced load. The dead end towers are the strongest and heavy. In practice large angle towers are designed so that they can be used as dead end towers. Doing so will eliminate the need for designing one more tower type that is dead end. 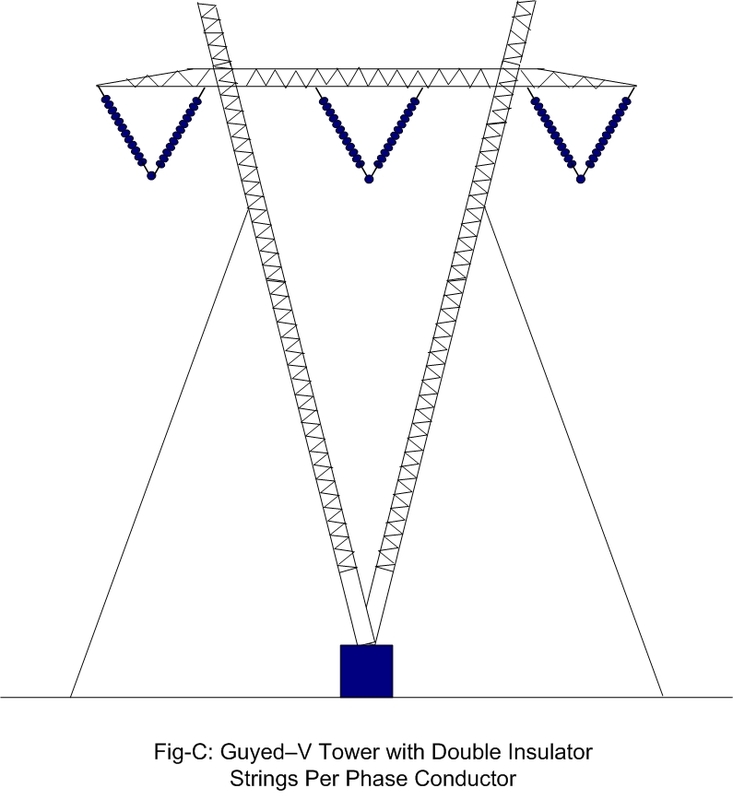 The angle towers use tension insulator strings. See the picture below. The numbers of transmission towers required to be erected per kilometer depends on the topography of the line route. So the span length of the line depends on the topography. For a particular conductor, the span should be such so that under highest temperature the line maintains minimum clearance (as per local standard) to ground or other nearby objects. Obviously more towers are required to be erected per kilometer in hilly or other difficult terrain. When the path of line deviates more often from the straight route then the line requires more towers per kilometer. Angle towers are used whenever the line route such deviates so that the suspension tower cannot be used. From the above discussion it is clear that the choice of transmission tower types depends upon several factors. Also you must have observed that when the tower carries only one circuit then the phase conductors are usually arranged horizontally(or triangular form). 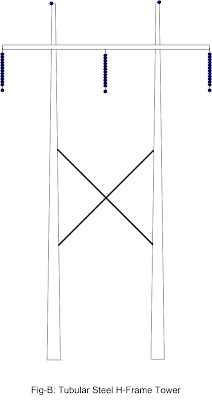 In this arrangement more Right Of Way is required but the tower height will be less, resulting in saving in tower materials so tower cost is reduced. 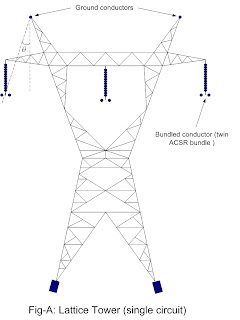 When the transmission tower carries two or more circuits, then the phase conductors are usually arranged vertical (See above photograph and Fig-D sketch). In this configuration the requirement of Right Of Way is less but tower height is more. Usually this is the choice in double or multi-circuit case. Sometimes double circuits are also arranged horizontally and single circuit vertically according to the availability of Right Of Way and optimized total cost. The type of tower foundation depends on the soil type where the tower is to be erected. Some common foundation types are for dry soil, wet soil, rocky soil, sandy soil and submerged type. In most cases existing standard design can be adopted to reduce the overall cost of tower installation. In the earth quake prone areas, data pertaining to seismic activity of the area is very important for consideration in foundation. The foundation cost on river bank or river bed is much more than on plain land. The design of transmission tower and line is complex which need to consider loading under different conditions. Several softwares are available in the market for the analysis and design purpose. I am searching for pictures of electrical transmission towers. Specifically pics of towers that carry electricity from Boulder Dam into the Southern California area. These are So. cal. Edison towers and are at least 55 years old or older and run along the Rio San Gabriel River / riverbed through the northern part of an LA suburb called Downey. I need them for a short story I am working on that contains one of these towers as its major focal point. I would appreciate any assistance. I was searching for different types of transmission line construction then I was able to bump to your blog. I guess I could you as my link since our topic is related. You Have Innocent informations about electricity projects.I liked it. I would like comparison of costs of fabricating and erecting distribution tower. The best data I've seen range from around $80,000 to over $400,000 each). There has been a lively discussion directed at buried or underground distribution lines, that over a 50 year life, the below ground system would be more than 1/2 the cost as overhead distribution. The savings are in power losses. Buried cable has much less. I live in Kerrville, Tx, and a massive transmission line project is under way. This is all new construction ans I am puzzled. There are tubular towers and lattice towers being used and I was wondering why there seems to be on rhyme or reason. What or who decides which sort of tower is to be used? Just curious. Hydro-Quebec and Northeast Utilities are trying to build a high-tension DC power line from the Canadian border to central NH. The lines will transverse many protected forest environments including preserves and the White Mountain National Forest. There is little soil along this route, mostly granite ledge. How will these towers be "secured" to the ground so that winds won't blow them over? These towers will be crossing over high rocky ridges in Many areas along a 180 mile route. Any information you can provide on this aspect of tower construction would be very helpful. Thank you. I am searching for pictures of electrical transmission towers, and diferent types of them. Could somebody give a link where i can find information, I work for a company which sell tower and I need more information. Although I have this question. 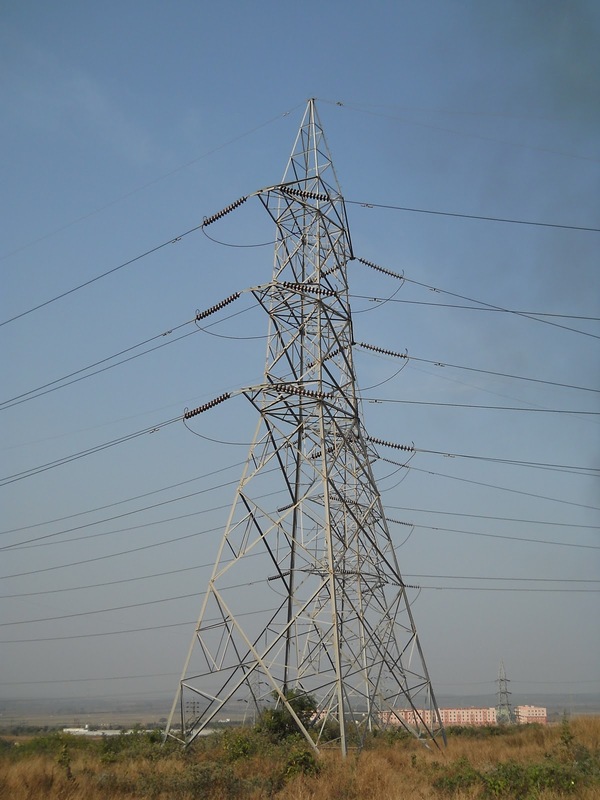 How can one calculate the height of a Tubular tower for AC Transmission lines of 132kV...?